Or the red and white one that replaced it? On one hand, the original costume was a masterpiece of Seventies Blacksploitation tropes, from the crazy bird medallion to the plunging neckline to the Michael Jackson-anticipating single glove. You also have to admire anyone willing to go out wearing red and green year-round and not just at Christmas. He's sort of like Disco Santa, but with an edge. On the other hand, the "modern" red and white version is a travesty of both form and function, from the pathetically inadequate armpit feathers to the absurd tiny yellow faux talons on his feet to the is-that-a-beak-or-acne yellow doohickey stapled to the bridge of his nose. Honestly, I don't understand how any self-respecting raptor could bear to be seen in public with that travesty of an attempt to look like a bird. For the love of Pete, he's got fake red wings on his stomach! I bet half the screeching that bird does is a vain attempt to say "You don't fly with your tummy, idiot!" and the other half is "Someone shoot me, please!" At least he kept the virile plunging neck, although without the big gold belt buckle it looks more like a vest. And nothing says "Fear me, villain" like a vest. I suspect that scholars will debate this deep question of relative suckitude for as long as we have internets. Or retinas to be burned by looking at these outfits. Or a flock of angry falcons, their wings ceaselessly beating out their plaintive wail of fashion-inspired despair. Hope you’ll forgive the slightly off-topic comment, but I thought you might like to see This post of mine in which I show off a villain of mine and show how I put the prize you drew for me to use. I hope you’ll consider his costume a good one for a bad guy.Enjoy! 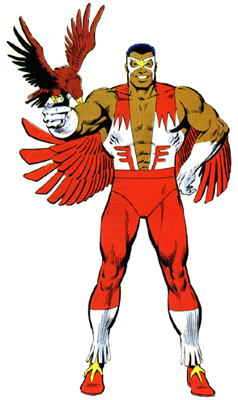 If you like the blaxploitation factor of Falcon’s costume, you should look into theissues of Milestone’s ICON comics that featured Buck Wild. The man was a parade of all the best (parody) blaxploitation costumes of the age, from Luke Cage to Brother Voodoo. I always worried about Falcon (and Hawkman’s) b.o., myself. I still don’t get the color schemes on either of them in relation to their chosen animal motif, but even WORSE is… “The Vulture”!!! And, yeah I am fully aware of the villain’s color schemes during the golden age, but even the Hulk got ‘fixed’, alright? Ai-ight, then. Now, speaking of exploiting brown peoples like me, let’s discuss “The Black Panther”. …and why Icon is more uber than Superman. That second version of him looks like it’s right out of Heromachine. You’re not trying to pull one over on us, are you Jeff? 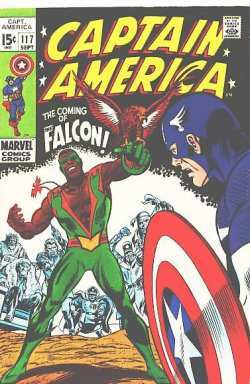 Does anyone else think ‘The coming of the Falcon’ might violate the Comics Code Authority?